I think I've written about it before... that I feel sort of drawn to Arthurian legend. Something about it just fascinates me, but I haven't read much about it. I really only know a general outline of which events occurred and the main set of characters. I wonder why that is? Maybe I'm not looking for or reading the right types of books? I'm not sure. Perhaps you can recommend something good for me? I really only know the basics and would like to know more. 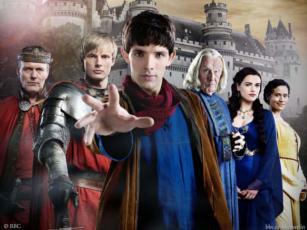 I do, however, get very excited by the BBC's Merlin and look forward to watching it every week. I'm an episode behind at the moment and while I know that there are flaws in the show, it's still very fun to watch. And the best part is that my Eldest absolutely adores watching it with me. He loves how Merlin is so clumsy, he loves watching the swordfighting and while I thought he might be a bit scared of some of the villians in each episode, he instead laughs and enjoys himself, same as I do. The other night before bed, Eldest and I were curled up on the sofa together watching an episode of Merlin and I remembered that we'd taken him to see the Winchester Round Table earlier in the year and he's always been interested in castles and knights and things like that. I was thinking perhaps it'd be a good idea to read up more on Arthur together. Do you watch Merlin? Do you have any books about Arthurian legend to recommend for me? not a book recommendation but if you ever get anywhere near cornwall you need to visit tintagel - awesome place - your kids would love it! I second the Tintagel suggestion. I went a couple of years ago and it was absolutely fascinating to walk around. I'd love to go again. Oh, I love that Round Table in Winchester. My Dad took us to see it only a few years ago. It was only then that I realised what it symbolised. Duhhh. I get there in the end. Ms Mac - ha, you are hilarious :) We took the boys last summer and they were not interested AT ALL. Only wanted to run around the hall for awhile. Oh well. When they're older. Merlin is one of the few programs I make a point of watching. Even though I'm starting to get frustrated be the need to keep Merlin's powers secret. I think it's starting to get tired and leads to repetitive story telling tricks. Still love watching it though. Jenny - I would agree with you. I'm usually two episodes behind, but that's true for most television programmes I wach! If you haven't read the Dark is Rising books by Susan Cooper, you must. There are bits of Arthurian legends woven into the stories, and they're not necessarily the obvious bits!